A college football hero, charismatic conservative, and gifted public speaker, J. C. Watts had star power when he took the oath of office as a Member of the first Republican majority in 40 years. One of two black Republicans in Congress in his freshman term, Watts cited his humble roots in a segregated Oklahoma farm town as the source of his belief in self–reliance and disdain of social welfare. “I wasn’t raised to be a Republican or Democrat,” Watts recalled. “My parents just taught by example. They taught me and my brothers and sisters that if you lived under their roof, you were going to work.”1 Watts quickly became one of the GOP’s most visible spokesmen, quickly rising to the position of Republican Conference Chair—the fourth–highest–ranking Republican in the House. His uneasy relationship with party leaders and a desire to spend more time with his family cut short Watts’s Capitol Hill career in its prime. Following Watts’s graduation in 1981, the New York Jets, a National Football League (NFL) team, offered him a place on their roster, but it was not in his favorite position as quarterback. Watts turned down the NFL offer and played from 1981 to 1986 in the Canadian Football League (CFL).8 Watts then returned to Oklahoma to become a youth minister at Sunnyvale Baptist Church, in Del City, Oklahoma. Ordained in 1993, he supplemented his ministerial income by opening his own highway construction company. His discontent with government regulation of his business led him to contemplate running for office. Watts faced a tough August primary challenge against state representative Ed Apple, winning 49 percent to Apple’s 48 percent; however, state law required a runoff primary if no candidate won more than 50 percent of the vote.16 In preparation for the September contest, Watts brought in high–powered Republicans to campaign for him, including New York Representative Jack Kemp, a football star, and National Rifle Association spokesman and actor Charlton Heston. Watts also secured the endorsement of the House Republican leadership. Apple lambasted Watts’s courting of out–of–state luminaries. Comparing his local campaign to Watts’s star–power support, he declared, “It’s grassroots vs. glitz.”17 The runoff remained close, but Watts prevailed with 52 percent of the vote. Watts’s victory established several milestones. He was the first black Representative elected from Oklahoma and the first Republican to win the district in 72 years.22 He was sworn in to the 104th Congress (1995–1997) as part of the GOP national tide, putting the party in power in the House for the first time in 40 years. Watts increased his victories in his next three re–election campaigns, winning by as much as 65 percent in 2000.23 He received assignments on the Banking and Financial Services Committee and National Security Committee (later renamed Armed Services). The latter panel was crucial to the oversight of the three military installations in his district. Watts left the Banking and Financial Services Committee for a spot on the Transportation and Infrastructure Committee in the 105th Congress (1997–1999). In the 106th Congress (1999–2001), he turned down a position on the prestigious Appropriations Committee when a seat opened midterm; he did not want to leave the Transportation Committee. Representative Watts supported a fiscally conservative agenda, voting 95 percent of the time for legislative initiatives from the Contract With America, a 1994 Republican campaign promise to limit government spending and corruption.29 Watts’s legislative emphasis was based on his belief that public assistance programs encouraged dependency in poor minorities.30 In 1995, Watts teamed with Representative Jim Talent of Missouri to create the Renewal Community Project, legislation that provided tax breaks and the deregulation of small businesses, school vouchers allowing parents to choose their children’s schools, and funding for faith–based organizations assisting low–income communities. In 2000 Watts reintroduced the legislation as the American Community Renewal Act, adding tax cuts for low–income communities as well as opportunities for home ownership. The new legislation also eliminated the capital gains tax and provided a “wage credit” for businesses that hired qualified low–income employees. Watts’s goal was to help low–income families save money. “Under the current tax system, we penalize savings and investment and productivity,” he argued. “Those are three things we should be rewarding.”31 The legislation gained bipartisan support. President William J. (Bill) Clinton’s administration supported the measure and Speaker Dennis Hastert dubbed the bill among the GOP’s top three priorities for the second session of the 106th Congress (1999–2001).32 The legislation was signed into law in December 2000. 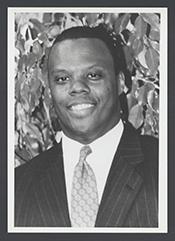 Representative Watts’s ability to draw national attention earned him a reputation as the GOP’s “Great Black Hope.”36 In 1996, the Republican Party tapped him to deliver the GOP response to President Clinton’s State of the Union Address.37 He was the youngest Representative and the first African American to be accorded this honor.38 Watts’s response was generally well received. He spoke about reducing the role of government in American lives. “Government can’t ease all pain. In fact, Government sometimes rubs the wound raw and makes healing harder,” he argued. “I’m afraid that when the [Clinton] Administration and others talk about race it sounds to me like the same old, same old—a bunch of sermons and sloganizing that defends the old assumption that Government can heal the racial divide.” Watts concluded that the GOP’s “mission is to return power to your home, to where mothers and fathers can exercise it according to their beliefs.”39 Watts was rumored as a possible vice presidential candidate in 1996, serving as co–chairman for GOP presidential candidate Bob Dole.40 Former Representative Kemp eventually received the vice presidential nomination. In 1998, Watts capitalized on a GOP Conference roiled by a poor showing in the midterm elections to challenge incumbent Conference Chairman John Boehner of Ohio. Though Republicans had maintained their majority, exit polls showed high African–American voter turnout in the South, the GOP’s stronghold, and only 11 percent of these Black Americans voted Republican—down from 18 percent in 1996.41 Though he claimed he was not running as a black candidate, Watts emphasized the GOP’s need for broader appeal to minorities. In a letter to House Republicans, he wrote, “It is time to let the American people know that the Republican Party is the party of all Americans. We are the party of inclusiveness. Our ideas are good for everyone.”42 Supporters emphasized Watts’s strong oratorical skills, noting that the GOP lacked a charismatic spokesperson. On Watts’s 41st birthday, November 18, 1998, he prevailed against Boehner, 121 to 93, in the race for chairman of the House Republican Conference, the GOP’s fourth highest position in the House.43 Watts was the first African American to join the Republican leadership and was subsequently re–elected to the position for the 107th Congress (2001–2003). In 2002, Watts declined to run for re–election to the 108th Congress (2003–2005), citing a desire to spend more time with his family, who had remained in Oklahoma during his tenure in Washington. “This business is hard on families,” he admitted. “I don’t want to do this for the rest of my life. There are other things I want to do and can do. You have to be careful about getting on this treadmill.”47 Prominent Representatives of both parties implored him to stay, recognizing that his unique position brought diversity to the House. “I hate to see him go,” noted CBC Member James Clyburn of South Carolina, a prominent Democrat. “J. C. is someone who really has been quietly and forcefully doing a lot of good.”48 Civil rights leader Rosa Parks, who, in 1955, famously refused to give up her seat on a Montgomery, Alabama, bus, wrote to Watts. “If you can,” Parks implored him, “please remain as a pioneer on the Republicans’ side until others come to assist you. I am glad that I stayed in my seat.”49 Though appreciative of the support, Watts noted that “the strength in this business is not hanging on. The real strength is to let go.”50 Watts’s political ally, Republican Tom Cole, won his congressional seat in the 2002 election. Though Watts left Congress, he did not abandon the political spotlight. He formed a consulting business and currently serves as a nationally recognized political analyst. 1Marc Sandalow, “The Republicans’ Great Black Hope,” 9 February 1997, San Francisco Chronicle: 9. 2“J.C. Watts,” Newsmakers 1999, Issue 2 (Detroit, MI: Gale Research Inc., 1999). 4“Watts, J.C., Jr.,” Current Biography, 1999 (New York: H. W. Wilson Company, 1999): 591. 5J. C. Watts, Jr., What Color Is Conservative? (New York: HarperCollins, 2002): 39. 6“J. C. Watts,” Newsmakers 1999. 8Watts started with the Ottawa Rough Riders before joining the Toronto Argonauts in 1985. In his rookie season, he led the Rough Riders to victory in the Grey Cup (the Canadian Football League championship). See “Watts, J. C., Jr.,” Current Biography, 1999: 591; “J.C. Watts,” Newsmakers 1999. 9Quoted in Jake Tapper, “Fade to White,” 5 January 2003, Washington Post Magazine: W6. 10“Watts, J. C., Jr.,” Current Biography, 1999: 591. 11Watts, What Color is Conservative? : 152. 13Watts’s service on the commission was clouded by accusations that he accepted large campaign contributions from the oil and gas businesses he was responsible for regulating. See Jo Thomas, “Rising Congressional Leader Experienced in Self–Defense,” 16 November 1998, New York Times: A1. 14Politics in America, 2002 (Washington, DC: Congressional Quarterly Inc., 2001): 825. 16Mick Hinton, “Watts Defeats Apple in 4th,” 21 September 1994, Daily Oklahoman (Oklahoma City, OK). 17Mick Hinton, “Watts Gains National Help in House Race,” 11 September 1994, Daily Oklahoman. 19Dan Balz et al., “‘Race Card’ in Oklahoma,” 20 October 1994, Washington Post: A24. 20“Perryman Says He’ll Swap Watts’ Afro Photo in Ad,” 21 October 1994, Daily Oklahoman; Thomas, “Rising Congressional Leader Experienced in Self–Defense”: A1; Patrick Rogers et al., “Calling His Play; Former Gridiron Star J.C. Watts Is Now Scoring Points for the GOP,” 24 March 1997, People Magazine: 141; Mick Hinton, “On the Campaign Trail Watts, Perryman Stump in 4th District,” 31 October 1994, Daily Oklahoman. 21“Election Statistics, 1920 to Present,” available at http://clerk.house.gov/member_info/election.aspx. 22“Julius Caesar Watts,” Associated Press Candidate Biographies, 1996. 23“Election Statistics, 1920 to Present,” available at http://clerk.house.gov/member_info/election.aspx. 24Chris Casteel, “Watts Striving to Reach Out to Black Voters,” 15 July 2000, Daily Oklahoman. 25Janelle Carter, “Watts to Bush: Get Back On Offense,” 13 September 2000, Associated Press. 26“Watts, J.C., Jr.,” Current Biography, 1999: 591. 27Susan Crabtree, “A Different Kind of Speakership for Watts,” 24 October 2002, Roll Call. 28Quoted in “J.C. Watts, Jr.,” Contemporary Black Biography, Volume 14 (Detroit, MI: Gale Research Inc., 1997). 29Sandalow, “The Republicans’ Great Black Hope”: 9. 30“Watts, J.C., Jr.,” Current Biography, 1999: 591. 32Jim Myers, “Watts’ Plan Gets Push; Re–election Question Yet Unanswered,” 7 January 2000, Tulsa World (Tulsa, OK). 33Steven A. Holmes, “2 Black G.O.P. Lawmakers in House Differ Slightly on Affirmative Action,” 6 August 1995, New York Times: 22. 37Watts had previously rebutted President Clinton’s post–election radio address in 1994. See “Watts, J.C., Jr.,” Current Biography, 1999: 591. 38Watts’s response, delivered before a live audience in the Library of Congress, was quickly overshadowed by the announcement of a verdict in the civil trial of former NFL player O.J. Simpson. Some major networks divided their screen between Simpson and Watts, quickly returning full coverage to Simpson’s trial in California at the end of the Representative’s statement. Katharine Q. Seelye, “G.O.P., After Fumbling in ’96, Turns to Orator for Response,” 5 February 1997, New York Times: A1. 39Seelye, “G.O.P., After Fumbling in ’96, Turns to Orator for Response”; “J.C. Watts,” Newsmakers 1999. 41Edward Walsh, “For Watts, A Bid to Broaden His Party’s Appeal; House GOP’s Only Black Member Knows Spotlight, Aspires to Join Leadership,” 17 November 1998, Washington Post: A11. 43See Katharine Q. Seelye, “Mix of Old and New Is to Lead House G.O.P.,” 19 November 1998, New York Times: A1. 44See, for example, Robert Novak, “House GOP Leaders Unhappy With J.C.,” 19 December 1999, Daily Oklahoman; Art Pine, “Rep. Watts Says He Will Seek Reelection,” 1 February 2000, Los Angeles Times: A10; “J.C. Watts,” Newsmakers 1999. 50Chris Casteel, “Watts Says ‘It’s Time to Let Go,’” 2 July 2002, Daily Oklahoman. Papers: Papers not available to researchers at this time. Videocassette: 1990, 6 commercials on 1 videocassette. The commercials were used during J.C. Watts's campaign for the 1990 corporation commissioner election in Oklahoma, Republican Party. "Julius Caesar (J. C.) Watts, Jr." in Black Americans in Congress, 1870-2007. Prepared under the direction of the Committee on House Administration by the Office of History & Preservation, U. S. House of Representatives. Washington: Government Printing Office, 2008. Watts, J. C., Jr., with Chriss Watson. What Color is a Conservative? : My Life and My Politics. New York: HarperCollins, 2002. Watts, J. C., Jr., Dig Deep: 7 Truths to Finding the Strength Within. Washington, D.C.: Regnery Publishing, 2016.